If you’ve been hanging out on Real Time Farms lately, you may have noticed a few changes on the block. One of the biggest, and most noticeable at first glance, is the new site design. Doesn’t it look so schnazzy? Aside from putting together our new look, which we certainly couldn’t have done without the amazing graphic design skills of Abby Tovell of T Squared Design Studio, the Real Time Farms programmers have been plugging away at some awesome new updates to the site. Some you might notice, others are sort of behind the scenes. Today I’d like to highlight one of the newest, most fun and exciting ways that every user can now interact with the site. All users of Real Time Farms can now add their own profile picture–to do this, visit your profile (it’s the first page that appears when you sign-in or you can get there by clicking on your name in the upper right-hand corner of the homepage–screenshot below is an example) and click on “change picture” just below the little tractor in the box that is to the left of your name. Now, instead of just seeing the name of someone who posted a photo at your local farmers’ market, you can now also see their face. Perhaps you’ll run into them next time you’re at the market buying your weekly stash of veggies and you can tell them how much you loved their asparagus photos. 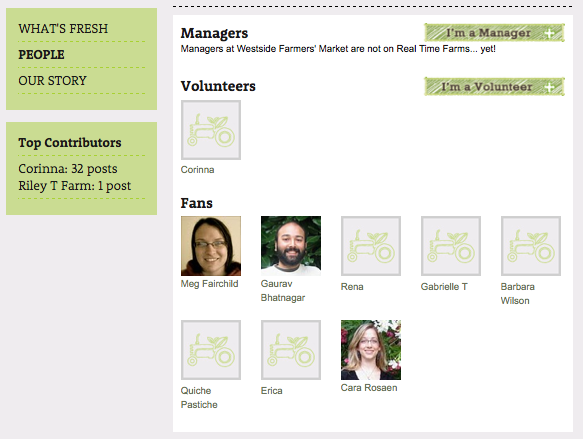 Another cool addition to our user profiles is the ability to select which farms or farmers markets are your favorites. Start typing the names of your favorite farms and markets into the green box on your profile page–see screenshot above–and then click the “Done Adding Favorites” button at the bottom. You can always return later to add more. Adding a favorite farm means that your profile picture and name will now appear as a fan on the “people” page of that farm’s profile. Are you more than just a “fan”? Do you volunteer on this farm, or are you actually the farmer who runs it? You can now add that too! Just click on the “I am the farmer” link and your name and profile picture will appear in the appropriate place. We hope you enjoy the new changes and take full advantage of them. We’d love to see all your bright, smiling faces up on Real Time Farms soon. Let’s give a big round of applause to Gaurav, the programmer that made these new features happen. This entry was posted in Messages From the Founders and tagged Abby Tovell, Gaurav Bhatnagar, Meg Fairchild, New Features, photos, Real Time Farms, T Squared Design, User Profiles. Bookmark the permalink.